Join the graduate students in HSSC 517 - Gender & Technical Knowledge for a film screening and discussion of the portrayal of gender and science in film. 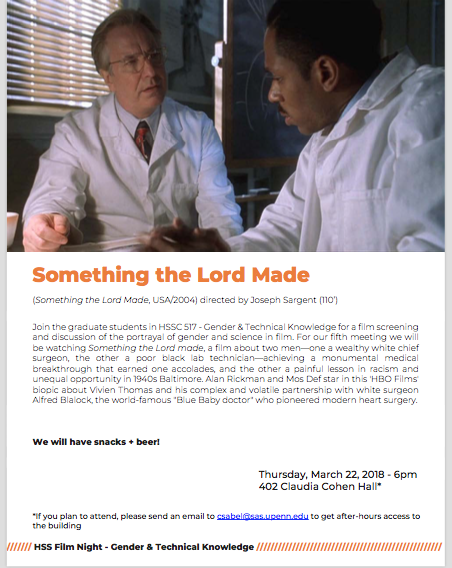 For our fifth meeting we will be watching Something the Lord made, a film about two men—one a wealthy white chief surgeon, the other a poor black lab technician—achieving a monumental medical breakthrough that earned one accolades, and the other a painful lesson in racism and unequal opportunity in 1940s Baltimore. Alan Rickman and Mos Def star in this 'HBO Films' biopic about Vivien Thomas and his complex and volatile partnership with white surgeon Alfred Blalock, the world-famous "Blue Baby doctor" who pioneered modern heart surgery.